Since I didn’t write many comprehensive reviews for elliptical machines, I’ve taken a closer look at one made by Ancheer. Ancheer elliptical machine offers a lot, as you will find out in my review. 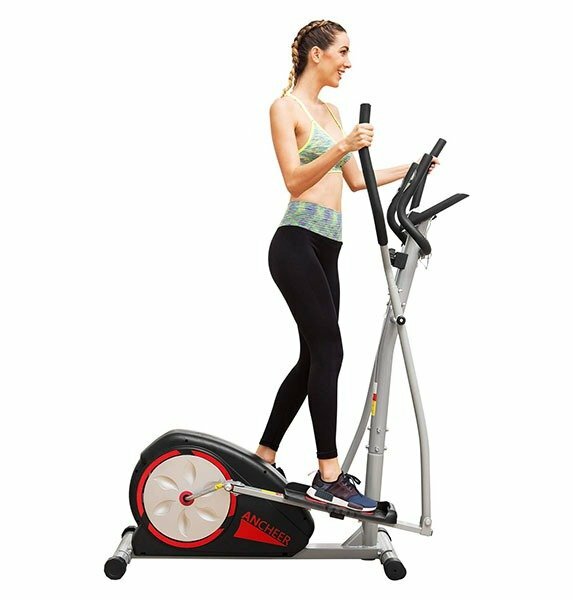 The Ancheer brand has been on the market for quite some time and they make all kinds of fitness equipment, like ellipticals, stepper machines, treadmills, exercise bikes, power towers, fitness trampolines, etc. So let’s take a closer look at Ancheer elliptical machine trainer and its features. The machine features heavy-duty frame which can support up to 250 lbs (113.4 kg). It is a V-belt driven system with magnetic resistance that supports 8 different levels. Thanks to the balance flywheel and belt drive the operation is smooth and quiet. The included LCD display provides you with the information such as time, speed, distance, pulse rate, scan and calories burned. Ancheer elliptical uses 13-inch long pedals with non-slip design. The machine is easily portable with the included front wheels. The assembled dimensions are 40.9 x 18.9 x 63 inch (104 x 48 x 160 cm) and the weight is 79 lbs (35.8 kg). Is ANCHEER Elliptical Worth Your Money? According to several reviewers online, the assembly is fairly easy, although it took most of the owners more than 90 minutes, which is more than I would expect. With the included tools and the manual however, it is doable by one person. The frame is high quality and the construction itself is quite sturdy. As long as you place it on even floor, you should not experience wobbling. The handles include pulse-rate, so you can monitor your heart rate. The handles are also quite comfortable on the grip and are also long enough, which is good if you are a taller person. The support of 250 lbs is definitely believable. Thanks to the belt-driven system the operation is very silent, practically unnoticeable. This is a huge plus if you are living with family or roommates – the sound will not bother anyone. Considering the 8 different resistance levels, it does not matter if you are just starting with cardio or if you are a daily runner, you will find the level that suits you without a problem. They are also quite easy to change, which is a plus. The LCD display of the ANCHEER Elliptical is pretty standard and offers everything you might need, including distance, time, speed, calories burned, scan and heart rate. According to several online reviewers, the pulse rate is pretty accurate, which is not really common among models within this particular price range. The pedals are really comfortable and long enough to accommodate even a bear comfortably. The non-slip design makes sure you won’t fall down or slide to another room. If the main question is that if Ancheer elliptical machine is worth the money, the simple answer is yes. It features everything one might need from an elliptical trainer. As long as you are under the maximum supported weight and you are looking for such machine, I’d say go for it.